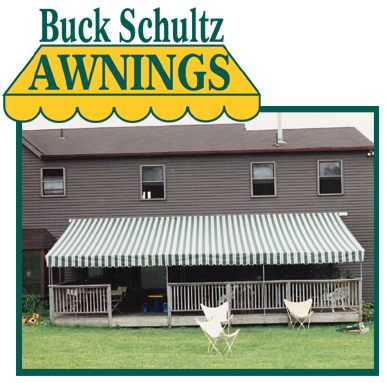 Buck Schultz Awnings has been manufacturing custom-made canvas awnings for 4 generations. Our talented craftsmen will fit your home or business with the perfect awning, bringing you relief from the sun’s harmful rays. We custom design your canvas awning and framing in our own factory. Everything is done on our premises, no outsourcing! All panels are sewn together with French seams. These are done with a single needle lock-stitch sewn twice. All stationary awnings manufactured with Velcro attached rafter covers. All framing is produced using galvanized steel pipe, (no aluminum), with threaded ends and fittings. We use the highest quality American fabrics. We offer yearly removal and installation for all units we manufacture. Call 610-277-1481 today for a free estimate.